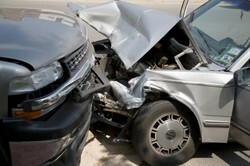 Los Angeles & California Head-On Collision Accident Lawyers With Over 40 Years of Experience That You Can Trust! Please Contact Our California Personal Injury Lawyers Now for a FREE Courtesy Consultation and Evaluation of Your Case If You or a Loved One Sustained Any Head-On Car Collision Injury in Los Angeles, San Fernando Valley, Ventura or Anywhere in California. There were 16,620 drivers injured in head-on collisions and 487 that had fatal accidents in 2011, according to the California Highway Patrol (CHP). If you or any person you know suffered an injury or was killed in a head-on car collision or truck, motorcycle or any motor vehicle accident anywhere in Los Angeles, San Fernando Valley, San Bernardino or in the state of California, please contact our experienced head-on collision car accident personal injury lawyers today for an absolutely FREE COURTESY CONSULTATION. For more information about our head-on collision lawyers and law firm, please visit our web site home page for our accident attorneys and law firm information and credentials, our Attorney Profiles and client Testimonials. Usually the driver that is in the wrong lane, traveling in the wrong direction or swerves his or her car or other vehicle, either intentionally or accidentally, in front of another car, truck, motorcycle or other vehicle that is in the correct lane leads to the head-on collision and is at fault. If you are not at fault, always call the police (call 911), wait for the police to arrive and be sure a police report (often called a traffic collision report) is made. If it is difficult to determine who was at fault from the accident scene, then a special accident reconstruction expert may be brought in to identify the responsible party. Drivers are responsible for looking out for other vehicles and making sure they follow the motor vehicle and traffic laws of their respective state. Drivers also must always use caution on the road and make sure their vehicles are functioning properly. A head-on collision occurs between two vehicles when either one of the drivers gets into the other's lane, usually due to mistake, a vehicle problem or from some extreme and unsafe road conditions, or one or both drivers recklessly, negligently or carelessly get out of their lanes and into the direct path of each other's vehicles. A head-on collision often results in serious and painful injuries to the driver’s or passenger’s neck (sometimes called a whiplash injury), back and sometimes fractures or catastrophic injuries that can permanently alter one's life or lead to death and wrongful death claims. Anytime there is an injury from a head-on car, truck or motorcycle accident, it is wise to contact an experienced California & Los Angeles Car Accident Injury Lawyer. Please visit our home page, Attorney Profiles and Client Testimonials to learn more about our personal injury lawyers and law offices.